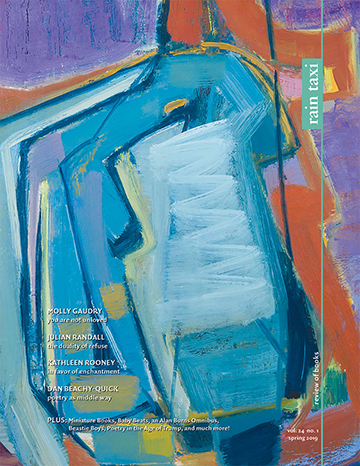 What a happy coincidence: Kevin Power’s collection of interviews with poets about visual arts, brought out by Alastair Johnston’s Poltroon Press, has appeared in the same season as Johnston’s own collection of interviews on printing and book arts, published by Cuneiform Press. Furthermore, the discussion in Where You’re At bears directly upon work discussed inHanging Quotes. 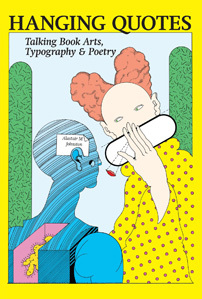 Each book contains numerous overlapping discussions of poets, artists, small presses, and other publishing projects from complimentary perspectives and different time periods, presenting a deep and broadly engaging view of the American small press poetry scene from the 1950s onward. 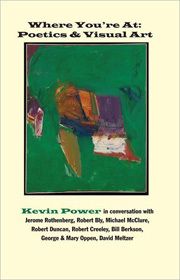 Not surprisingly, Donald Allen’s influential anthology The New American Poetry includes work by poets central to both books; for readers interested in discovering more about the contexts in which some of these poets lived and worked, often alongside visual artists and book publishers, the first-person histories in these interview collections are unbeatable. Power recorded his interviews in the 1970s and published the majority of them in a scattering of journals over the intervening years but only now has he had the opportunity to bring them together as a single collection. At the time, he was “working on a thesis for the Sorbonne concerning the relationship between poetry and painting in postmodern American poetry.” This led him to visit with the poets he was interested in, which turns out to be quite an eclectic group. If there is an odd man out here it’s arguably Robert Bly, although his quips back at Power make a lively contribution. His playful regard for contemporaries is both amusing and instructive, to wit: “One of the weaknesses of Ted Hughes’s latest book is that he’s a highly cultured and highly Westernized man and tries to make up a myth as if he were an Eskimo” or “I like Olson’s intellectual energy, I like the way he moves around in an intellectual world simply ignoring what the academics say.” Bly may not be read these days as part of the company he’s with here, yet that only makes his inclusion all the more strikingly worthwhile. I came upstairs one day and found a drunken man lying half way up the steps. I took him up to my apartment to sober him up a little. He was a very distinguished-looking man. I didn’t know who he was, but he appeared so sadly drunk. He liked my daughter a lot, apparently he had a daughter the same age. He was showing her how to make clay animals, they had all these pieces of sculpture all over the place. I went in and it all looked fine. He was sobering up so we gave him some coffee. He left soon after and later on Jay de Feo came in and asked me if I’d seen ‘Bill.’ I said ‘Yes,’ and she answered, ‘Well, that was Bill de Kooning,’ I looked down and all the clay animals had been put back into the ball of clay. The relationship between poet Robert Duncan and visual artist Jess Collins is one of the exemplary romantic partnerships between artists of recent history. Duncan describes to Power how he has “the notion that poets had as their practice, when they used to be a profession, to hear what birds are saying. We know this from legend. I think quite literally they had to go hear what the surf was saying, what children were murmuring in the garden.” He continues, relating the circumstance of his hearing the poem speak to him with Jess’s own practice: “language speaks to me when I write and not the other way round. Well, once in while I can be found ranting at the language. But the point that makes me want to get to the poem is that the language starts talking to me. And the paint talks to Jess, he’s adamant about that.” Living together, daily conversing with one another, Jess and Duncan encouraged each other’s art forward, and by way of example passed on an entire community of possibility to successive generations. He was a true hero for both men, but both of them were, understandably, contemptuous of sitting at his feet. This was no homage to the artist you respect, better to use what he gives you and get off his back than to be sitting night after night at his table drinking his beer or wine or whatever. The opposing natures Creeley describes—either giving everything up for art, focusing all one’s energy on producing work, or operating on a more practical, level-headed basis, doing what is needed to pay for food and shelter while also creating when time and the means become available—are the extremes every artist experiences. Having the opportunity to participate in a supportive community while tackling this dilemma is unbelievably enriching. I absolutely share your view about the importance of Dwiggins, but it isn’t Dwiggins, it’s Dwiggins plus Griffiths. Now Dwiggins plus Griffiths was a much closer partnership. I mean the Morison-Monotype-Pierpont axis was one of essential opposition. It was getting what Morison saw through the opposition of the machine works at Salfords. Dwiggins and Griffiths was a real meeting of minds. This is heady stuff, but well worth looking up; for anyone interested in printing and publishing, it is a treasure trove of insider wisdom. No doubt, in today’s digital world a poet coming of age can mix image and text together via the computer in ways unforeseen decades ago. Yet the relationship of poet to publisher, painter to poet, artist to artist, is not going away. The publishing arts, along with the communities that surround them, will continue to flourish as long as artists relentlessly seek each other out, whatever forms the art may acquire.